Labs, shops and other locations that use chemicals must comply with the hazardous materials provisions of the International Fire Code. This code limits quantities of certain chemicals based upon the physical and health hazards of the chemical, and establishes requirements for storage and use. The primary tool used to maintain compliance and safety is the University’s MyChem system. 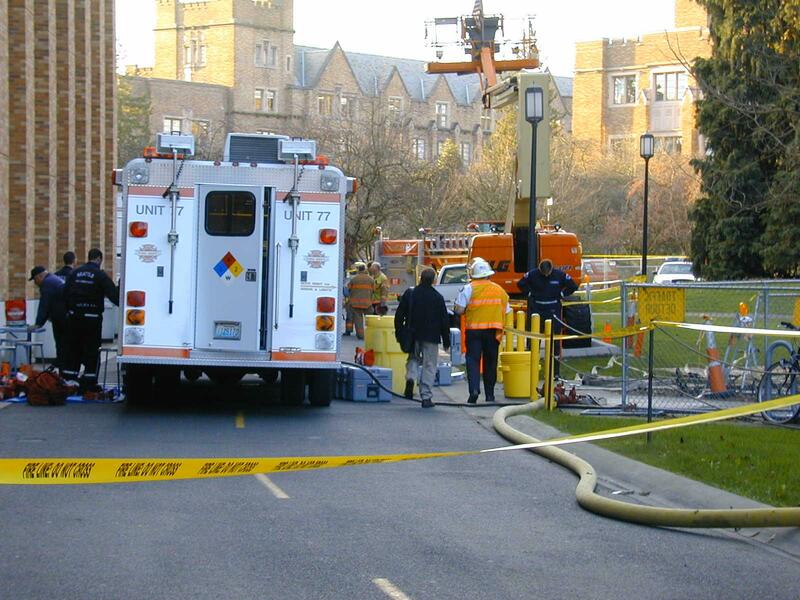 It compares quantities of hazardous materials present on campus to the fire code maximum allowable limits. These limits can vary by a number of factors, including the presence of fire sprinklers, location (indoor versus outdoor), storage cabinets and floor level. Keeping a current inventory of your chemicals in MyChem allows us to monitor for compliance and prepare hazardous materials inventory statements for the fire department. The MyChem system also acts as a repository for safety data sheets used during emergencies. Chemical inventories are used by EH&S to assist with applications for new building permits and initial fire code operating permits. Construction project managers may contact Diana Zumba at 206.616.5530 for assistance with gathering hazardous materials inventory statement information. Depending on the quantity, certain chemical hazard classes require permits from the fire department. Departments with multiple labs in the same building should consider consolidating their lab permits. Consolidated permits reduce the administrative burden of permit applications, renewals and inspections for both the University and the fire department, and may also reduce permit fees. Permit applications and conditions that must be followed are available on the Seattle Fire Department web site. Contact EH&S at 206.616.5530 for information and assistance with permits. Architects and lab planners designing new lab spaces should refer to the EH&S Laboratory Design Guide for specific recommendations. General safety information associated with hazardous materials for existing lab spaces can be found in your laboratory safety manual. If your lab does not yet have a specific laboratory safety manual you can download information and a template in the UW Laboratory Safety Manual. EH&S can help you use and store chemicals to achieve and maintain compliance with complex fire code requirements. I have three different lab spaces; does each need a separate permit? Not necessarily. If the labs are in the same building and under single control, one permit may be able to cover them all especially if a single source can be identified to pay the permit fee. Consolidated permits reduce the administrative burden of permit applications, renewals and inspections for both the University and the fire department. Fees may be based on quantities of materials and/or the number of control areas covered. Some buildings have prorated fees by lab space to charge back to grants or other operating funds. Should my corrosive or flammable liquids cabinet be vented? It is not required but many are vented to reduce odor build-up that can occur within the cabinet. Venting must be installed correctly so that the fire integrity of the cabinet is not affected. More information about storage cabinets can be found in Section 6 of the Laboratory Safety Design Guide. Our recent lab survey showed we have too many flammable liquids. How much are we allowed? Quantity limits can vary by a number of factors, including the presence of fire sprinklers, location (indoor versus outdoor), storage cabinets, and the floor level of the building. Also, the limit is not based on individual rooms but the entire control area, which includes many rooms and may encompass multiple floors. EH&S can help sort through these variables and help labs work together to stay below maximum quantities.